The holiday season is almost here, which means it is time to reevaluate your sales strategies. If you aren’t using third-party marketplaces to enhance your company’s sales during the holiday season, it is time to explore your options. Holiday sales play a critical role in the success of any retail business, which is why it is important to sell your products in a third-party marketplace. It’s easy to get started with a few simple steps. Start by identifying the right marketplace for your business, such as eBay or Amazon. Take the time to determine the exact demographics that pertain to your business. This includes determining exactly what consumers are buying and which marketplace they are more likely to purchase these products from. This could be your starting point and could quite possibly be the place that makes your sales take off. Do You Have New Products? 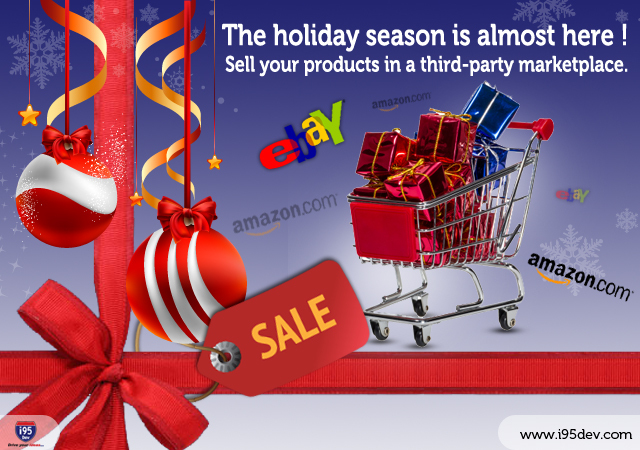 The holiday season is a great time to introduce your new products to the marketplace. With a large number of eager buyers constantly visiting the popular marketplaces, such as eBay and Amazon, you will expose your new products to a large market with little effort. You will have access to a large affiliate user-base that has incorporated powerful search capabilities, as well as incredible customer service that brings customers back again and again. When you use the services of the available marketplaces, you eliminate the hard work and sometimes unsuccessful efforts of launching a new product. Finding the right target market, getting the word out and selling your product can be a tiring process. Use the services of a marketplace to promote your new product, as well as its promotions and discounts, to get those sales going. Determine the price that is marketable, yet will yield you the profits you need. The experts at i95Dev can seamlessly integrate your e-commerce store with eBay through the use of the open source eBay extension. This extension allows you to sell your products and effectively manage all aspects of the entire process, including managing orders, inventory and shipping. Our experts at i95Dev can also ensure the entire shopping process is user-friendly to enable you to increase your sales during the hectic holiday season. In addition, i95Dev can assist you with integrating your eCommerce store with Google, allowing you to get your products in front of more customers, allowing them to easily compare products. We will help you price your products competitively as well so your sales increase the most this holiday season.